Matt Nagy expressed distaste Monday with Cody Parkey's "Today" show appearance last week following his blocked kick with five seconds left in the Bears' 16-15 wild-card weekend loss to the Eagles. But maybe he's really more upset with GM Ryan Pace for signing Parkey to a four-year deal before the season? Matt Nagy [expressed distaste Monday](http://www.espn.com/nfl/story/_/id/25761472/bears-coach-matt-nagy-not-happy-cody-parkey-talking-miss-tv) with Cody Parkey's ["Today" show appearance last week](https://www.today.com/video/chicago-bears-kicker-cody-parkey-describes-heartbreaking-missed-field-goal-1424083523512) following his blocked kick with five seconds left in the Bears' 16-15 wild-card weekend loss to the Eagles. "We always talk about a 'we' and not a 'me' thing, and we always talk as a team, we win as a team, we lose as a team," Nagy said at his season-ending press conference. "I didn't necessarily think (the 'Today' show appearance) was too much of a 'we' thing." But maybe the coach is really more upset with GM Ryan Pace for [signing Parkey to a four-year deal](https://bearswire.usatoday.com/2018/03/14/new-bears-kicker-cody-parkey-gets-four-year-15-million-contract/) (with $9 million guaranteed) before the season? The five-year veteran Parkey's career-high [seven missed field goals](https://www.pro-football-reference.com/players/P/ParkCo03.htm) in the regular season and three missed extra-points -- including two of each off the uprights in the same game -- really didn't negatively affect the Bears. Only one of Parkey's misses came in a loss, and granted, it was a big one, as it came in overtime in Miami and would've won the game. __ALSO:__ [Tom Brady will be a rare playoff underdog in the AFC Championship Game](https://www.betchicago.com/tom-brady-patriots-rare-playoff-underdogs-afc-championship-game-chiefs) Had Chicago (12-5 SU and ATS) come away with that victory, they wouldn't even have been playing wild-card weekend. They would've gotten the No. 2 seed over the Rams based on the head-to-head tiebreaker they later achieved. But Parkey wasn't the goat that day in Miami. The kick was a 53-yarder on the notorius messy grass in Miami, the Bears also lost two fumbles and Mitchell Trubisky threw a pick, and the defense allowed a Brock Osweiler-led Dolphins offense to put up 31 points, including a 75-yard touchdown to tie the game with three minutes left. Plus, if you remember, the Bears should've lost the game on the previous drive, but were gifted a fumble. <a href="https://www.youtube.com/watch?v=EjNoDGxx_gw" class="embedly-card" data-card-width="100%" data-card-controls="0">Embedded content: https://www.youtube.com/watch?v=EjNoDGxx_gw</a> ## Cody Parker's affect on Bears ATS record Parkey's misses really didn't affect the spread, either. Only two of his misses came in games the Bears failed to cover -- the Miami game and a 46-yarder in a 16-14 Week 3 win in Arizona, but the Bears closed as 5.5-point favorites in that game, so the kick still wouldn't have put Chicago over the number. 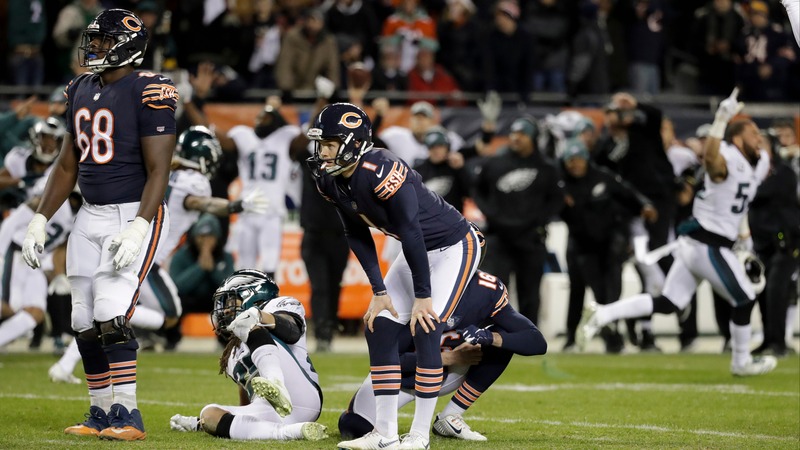 Parkey's slump maybe should've prompted the Bears front office to seek other options, but [Nagy stood by his side](http://www.espn.com/nfl/story/_/id/25249272/cody-parkey-chicago-bears-lose-job-missing-four-kicks-uprights) after the almost surreal performance against the Lions, and the $9 million guaranteed that was coming his way probably contributed to their loyalty as well. __ALSO:__ [Finding the best Super Bowl odds](https://www.betchicago.com/super-bowl-53-odds-futures-conference-championships) Look, it's hard to kick a 43-yard field goal in the cold (just ask [these jabronis](http://www.nfl.com/videos/chicago-bears/0ap3000001010298/Fans-attempt-to-make-Cody-Parkey-s-missed-43-yard-FG)), especially when the ball gets tipped ([coincidentally by a guy named Hester in Chicago](http://www.philly.com/eagles/treyvon-hester-cody-parkey-double-doink-eagles-bears-saints-university-toledo-penn-hills-20190111.html)). And Parkey's teammates [seem to genuinely care for him](https://www.si.com/nfl/2019/01/07/cody-parkey-chicago-bears-teammates-support). But it appears the marriage between he and the Bears will last only one season. Kickers are like relief pitchers in baseball, in that they're constantly on the move, and giving them long-term deals rarely works out in the team's favor. Parkey was an undrafted kicker out of Auburn who missed 14 field goals in three college seasons. He won a job -- again, coincidentally -- with the Eagles in 2014, became a Pro Bowler that year, but missed 13 games the next season with a groin injury and was waived prior to the 2016 season. The Browns waived him before the 2017 season, he had a strong year for the Dolphins and then he cashed in. It wouldn't be shocking if he went on to have a nice career elsewhere. But fans are fans, which is why many of them are cursing Pace for not keep [Robbie Gould](http://www.espn.com/nfl/player/_/id/9354/robbie-gould).